An easy slow cooker chili recipe that develops incredible flavor as it’s slow cooked in the crock pot all day long! 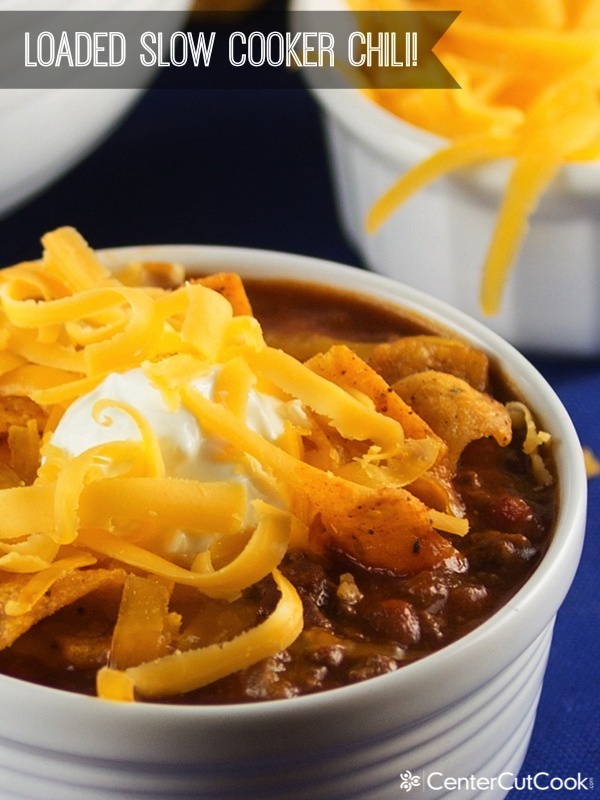 Topped with sour cream, cheese and Fritos, this is a recipe everybody is going to love! Chili is so much like pizza in that it changes depending on the region that you’re in. If you’re in Cincinnati the chili has some sweetness to it and is often served over spaghetti. If you’re in Texas, you’ll find that the chili has no beans. And then of course you have your bean and meat chili, vegetarian chili, white bean chili, and the list goes on and on. The chili recipe I’m sharing with you today is slow cooked all day long so that it’s bursting with flavor! My Mom’s chili consisted of kidney beans and hamburger, and as a kid, I hated it! I’m sure it was delicious, but I was a little finicky and didn’t grow to like the stuff until probably my teen years. Now I love chili but, as luck would have it, I am married to someone who isn’t a huge fan of soups or chills in general, so I tend not to make them that often. Despite this, I try to make a pot of chili at least once a year to get my fix! Each time I make chili, I find myself tweaking the recipe and experimenting with different flavors. This year’s version turned out even better than I expected it to! It has just enough heat without being overbearing, and it’s got several ingredients that give it some good deep flavor (think bacon and roasted red peppers). 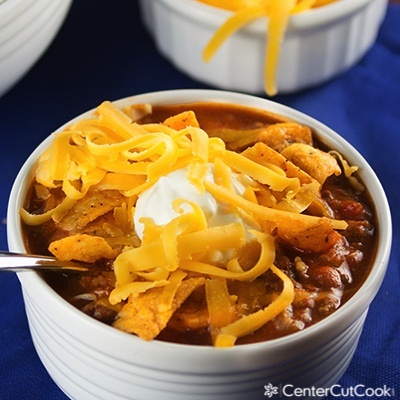 My favorite way to serve this hearty chili is “loaded” with crunchy Fritos, diced onion, shredded cheddar, and a dollop (or two) of sour cream. And you must, I mean must, cook this Chili in the crockpot on low for at least 8 hours. I know, it’s a long time, but the longer this simmers, the better it’s going to be! 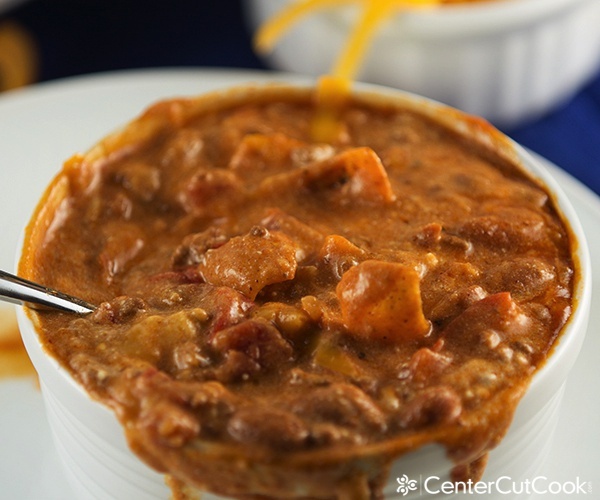 This chili is just perfect for a cold day, or for the big game! Now go get yourself a big bowl and spoon and dig in! In a large skillet, drizzle a few teaspoons of extra virgin olive oil and sauté the chopped yellow onion. When the onion becomes translucent, add in the Italian sausage and ground beef and cook. Drain off excess fat. In the pot of your slow cooker, place meat/onion mixture on the bottom. Add in Ro*Tel, beans, Tomato Paste, Celery, Garlic, Bell Pepper, Roasted Red Pepper, and chopped bacon. Add in seasonings – chili powder, salt, black pepper, paprika sugar, oregano, cumin, basil, and cayenne pepper. To the pot add beef stock, hot pepper sauce, and Worcestershire. Use a large spoon to stir the ingredients so that the seasonings and veggies are incorporated throughout. Turn the slow cooker on low and let it cook for at least 8 hours. If you’re in a rush, you could cook this on the stove and would need to let everything simmer for at least two hours, but your results aren’t going to be quite as good as the slow cooker method. When ready to serve, top with your favorite garnishes including Fritos, sour cream, cheddar cheese, and diced onion. This is a CenterCutCook original!